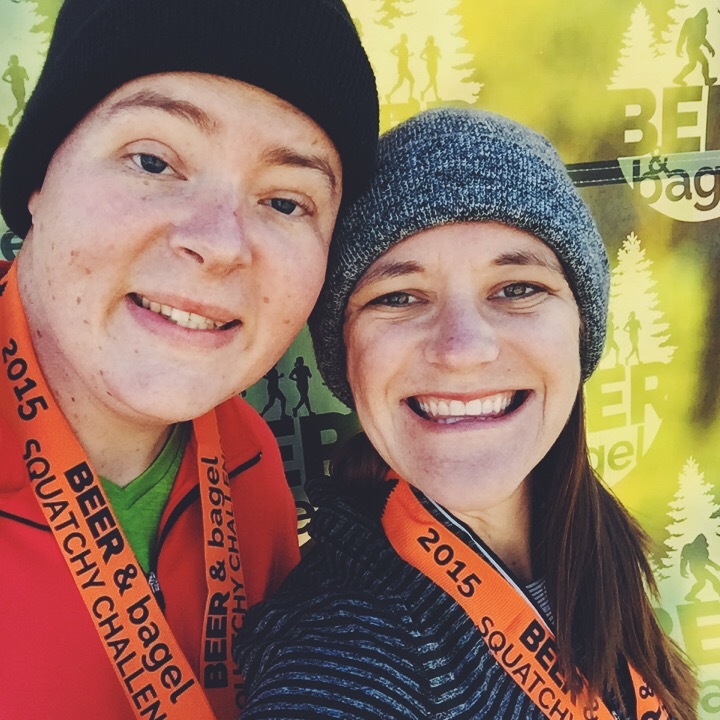 beer & bagel squatchy challenge » hk in love. 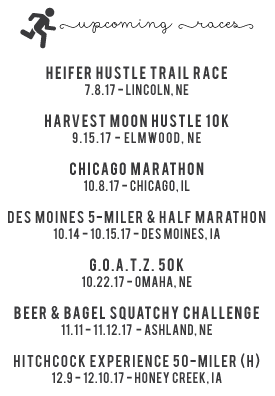 Last weekend we participated in our first multi-race weekend: the Beer & Bagel Squatchy Challenge at Quarry Oaks Golf Course in Ashland, NE. This challenge consisted of a half(ish) marathon on Saturday followed by a 4-ish miler on Sunday. On hilly trails. 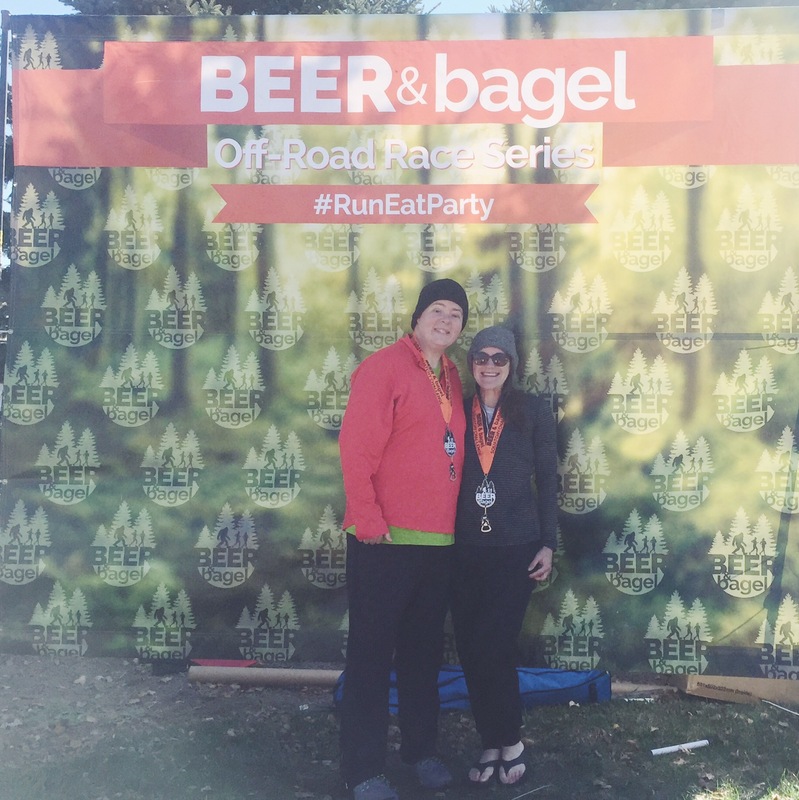 Having heard great things about Beer & Bagel in the past, we had started looking into doing the 4-miler a couple of weeks before the Chicago Marathon. We figured it would be a fun way to close out racing season, and even though trail races are more challenging than road races, 4 miles is a manageable distance. When we went to register, however, we discovered that they were also offering a halfish marathon distance, and that doing both races, or the “Squatchy Challenge,” qualified you for a special finisher’s medal. That was an easy choice. We like medals. After Chicago I thought that I might have to skip out on these races thinking that they might be a bit too risky for my leg, but I’ve continued to take it fairly easy since the marathon and things seem to be healing up well (going purely off of feel here) so just as with Chicago and the Good Life Halfsy, I felt confident towing the starting line, taking it easy, and backing off if and when I felt necessary. I’m so happy that I was healthy enough to participate because this weekend of races turned out to be SO MUCH FUN. Ashland is about a 30-minute drive from our house, so we left around 7:15 for a 9:00am race time. Since this was the inaugural year of the halfish, the race field was pretty small (just over 200 runners), so we were able to park quickly and fairly close to the start line. 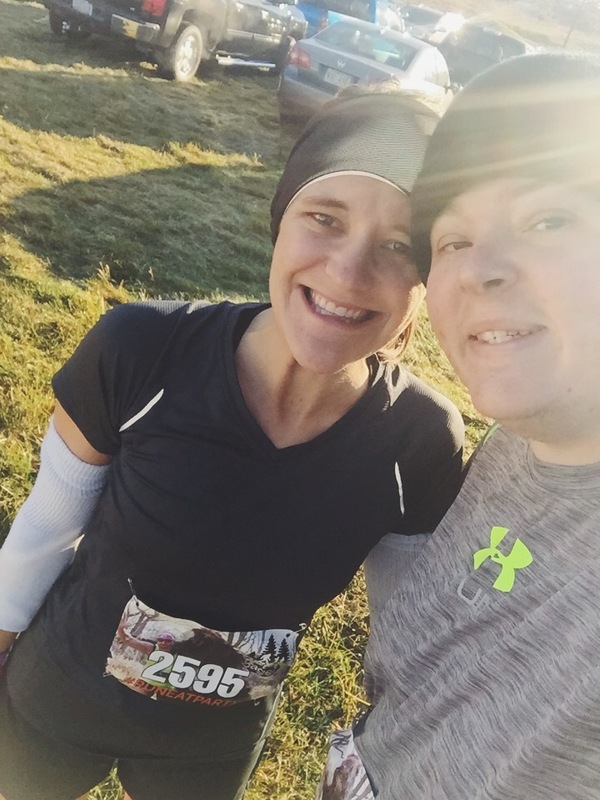 We stayed in our car for a few extra minutes (it was chilly – just under 40 degrees), had our breakfast (mini bagel with peanut butter, and a banana), put on our arm warmers (old socks with the ends cut off), and then headed up to the start line area to hang out at around 8:20. One thing that I love about smaller races is that it’s usually a much calmer atmosphere. They had a few sets of corn hole/bags set up so we did that for a while, stretched a bit, and made our way over the start line a few minutes before 9:00am. We lined up near the front since the race was not chip timed (not that either of us were super concerned with time). And then we were off! The course was 3 loops of about 4.3 miles, alternating directions every loop. We ran together for most of the first loop, and then I split off to complete the rest of the race by myself. (I’m slowly coming to terms with the fact that I do not run well with others – at least in races). The course was really beautiful with lots of different terrain that kept it interesting (and challenging) – part paved road, part golf course/grass, part dirt trail, plus three creek crossings of varying difficulty including one that you needed a rope to get across. There weren’t many flat areas which meant you were either going uphill or downhill at pretty much all times – both really hard in different ways. I thought I would hate having to do three loops of the same thing, but since this wasn’t an area where I normally run, I never got bored and the alternating directions made it interesting (and Kevin and I got to pass and see each other a couple times). I didn’t really have a time goal in mind for two reasons: (1) even though I always want to put out a good effort during a race, I was mostly running this for fun, and (2) trails are a whole different ball game and I have no concept of what a “good” trail pace would be for myself. 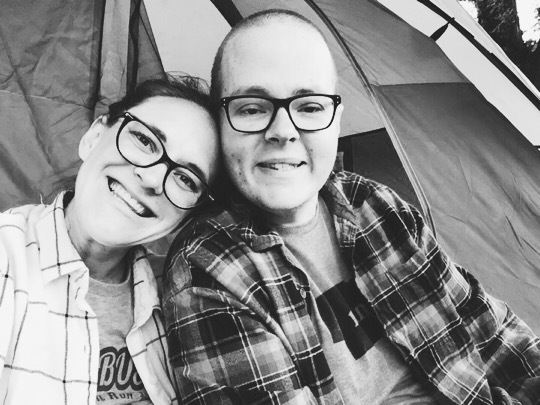 I tried to view these races as a way to celebrate the end of our racing season, break in our new trail shoes, and start getting more comfortable running on trails (we want to do more of it this winter). I finished in 2:19 and then waited for Kevin to come in (at 2:55) – instant PRs since this was our first trail half! 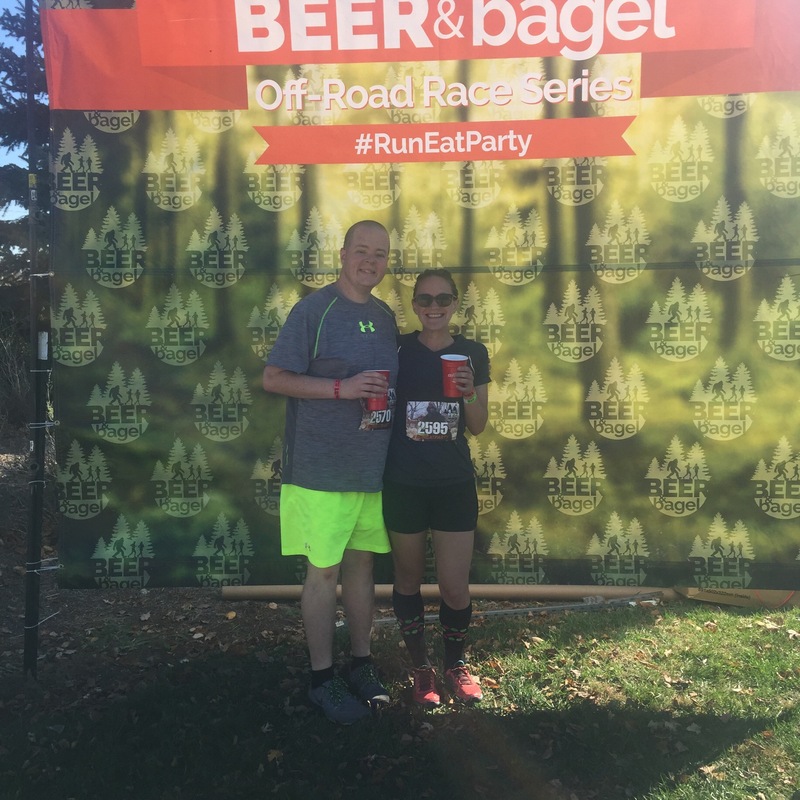 This was the Beer & Bagel run, after all, so after finishing we headed to the beer tent and were pleased to find several local craft beer options awaiting us! There were bagels, of course, but they were also grilling up burgers, so we opted for those instead. 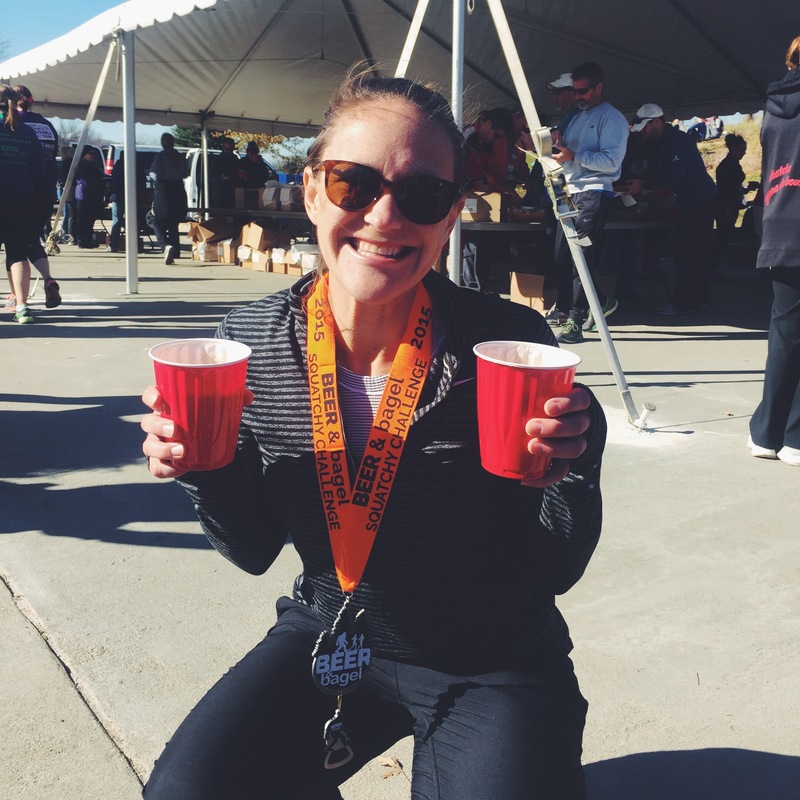 The post-race atmosphere was so fun – everyone brought chairs and blankets and set up camp to enjoy beers, food, and the awards ceremony. (Note to self to come more prepared next year). We hung out for awhile afterwards, took some photobooth pics, and headed home – after all, we had to do this all over again the next morning! Sunday we left our house a bit earlier – around 6:45 for the 9:00 start – since we knew Sunday’s race was larger and didn’t want to have to park far away. We got a good parking spot and once again hung out in our car for a bit, ate breakfast, and then headed to the start area. We forgot chairs, but happened to have a blanket in our trunk so we found a sunny spot and set our blanket up so we’d have a place to hang out post-race. We found our friend Teresa just before the race and of course had to take a pre-race group selfie! Doing this course for the second time was much easier, since it was only one loop and because we knew what to expect. The course was almost identical to Saturday’s, with the exception of the last 1/3 of a mile where they slightly modified the finish. It was also A LOT more crowded and there were several bottleneck areas. Even though I wasn’t trying to sprint through this, I did want to try to run the whole time, but it was pretty much impossible because there were so many groups of walkers spread across the entire width of the trail. I don’t mind when people walk in races – I do, too – but race etiquette and common sense would tell you to stay single file and move to the right if you are going to go slower. It was a bit frustrating but I tried to run in the areas where I could remind myself this was just for fun, and now I know what to expect for next year. On Sunday, I also ran through the creek crossings instead of using the ropes/stones to get across – that was fun (and I definitely, literally got cold feet)! I finished the 4.2 (ish) mile course in just under 43 minutes, grabbed a beer, and stayed near the finish line to wait for Kevin and Teresa, who came in together at just under an hour. 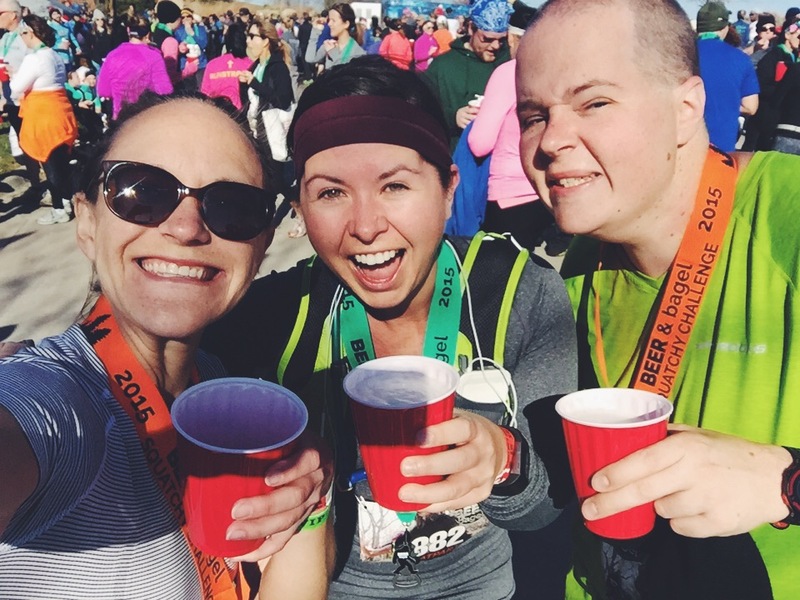 They grabbed beers and we took a post-race pic! We hung out after the race for quite a while – had more beers (when I went up for the second time, the guy insisted on giving me two – YOLO! ), food (chili and bagels – totally hit the spot), and got our special Squatchy medals! For early November, the weather was amazing – chilly at the start both days, but warmed up to about 60 by the end of the races and was super sunny – perfect for being outside! Both races were very well organized, with simple packet pickup, a great t-shirt (“drinker with a running problem”), and an amazing race director, who personally thanked us for participating in both days of the race. I’m so glad it worked out for us to do these races, and I think they’ll definitely be a regular installment for us moving forward. I don’t think I could ever give up traditional road running and races, but we definitely want to incorporate more trails into our training to build strength and mix things up a bit. 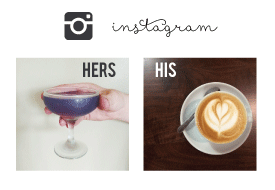 We’ve got some exciting stuff planned for 2016! This entry was posted in adventures. 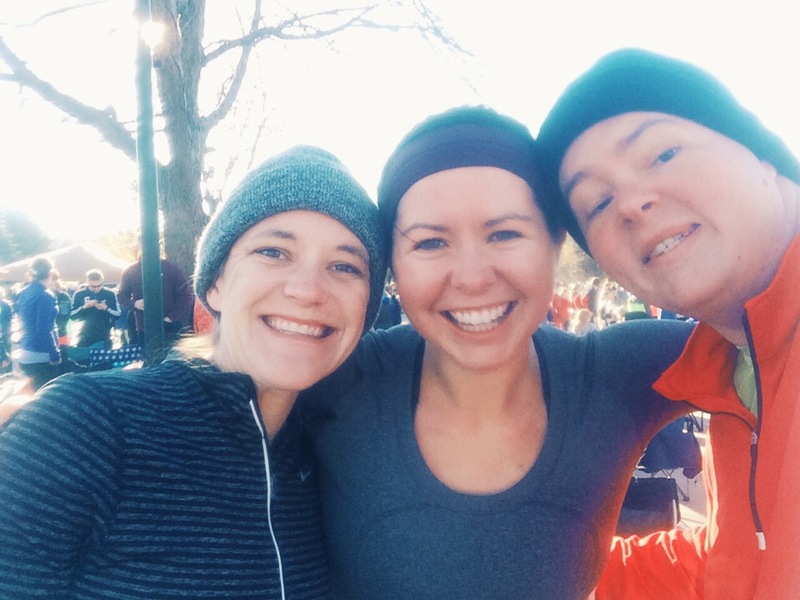 and tagged fall, race recaps, running. Bookmark the permalink.